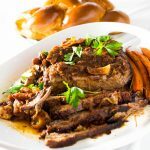 A simple and mouthwatering oven cooked brisket that is truly fuss free! Delicious, tender and freezer encouraged!!! This is the ULITMATE crowd pleaser! This is part of my perfect high holiday meal! With plenty of make ahead and freeze options…your dinner table this year will be a breeze! As we speak, Jewish housewives all over the globe are getting out their finest china, their crispest table cloths and their oldest recipes; all in preparation for the Jewish high holidays. And this year I have a super easy dinner plan for you. Loaded with tons of freezer friendly dishes that are ridiculously delicious and incredibly easy to just heat up and plate! It’s these holidays that bring me some of my fondest memories with my family. Golden chicken soup with fluffy matzo balls, tart apples with sweet honey and the star of the dinner : the oh so magical, dreamy, melt in your mouth brisket. Like many Jewish recipes, brisket gets its roots from the need to use up some of the least expensive pieces of meat and transform it into tender deliciousness. As the brisket cooks low and slow, connective tissue breaks down, leaving a tender piece of smothered meat. ” So Mila is it good?” And every year I nodded in agreement as I sloppily licked off the remains of the sauce off my lips. My aunt’s brisket may not have been perfect, but it was hers and it was always good. As an adult and a graduate of culinary school my love for oven cooked brisket remained the same. I made hundreds of briskets throughout my career and I was constantly searching for my recipe. I wanted a recipe of my very own. And I tried… I made smoked briskets, crock pot briskets, oven cooked briskets, French style briskets and the very worst, dry brisket. I took an idea or two from each recipe and moved on to create my brisket. This has become my no fuss no muss brisket recipe that I go to year after year. If there is anything I have learned from the hundreds of briskets I have made over the years, the technique is one of the most important aspects. Go low and slow. Low temperature, slow cooking. This will allow the connective tissue to break down and the fat to melt slowly, leaving you with that ultimate melt in your mouth brisket. There must also always be an acidic component. I use both tomato acid (ketchup) and wine to allow for a deeper and richer flavor in the meat and the sauce. The best thing about this brisket is that it is one pan and FREEZER ENCOURAGED. Make it ahead of time. Freeze it. And let it warm up in a 350-degree oven the day of service. It will be perfection. Something magical happens when you freeze foods like brisket or my amazeballs this to happen to food. It just works! And it could not be easier! You can also do it in the crockpot…but my brisket never fits in there when I cook for the holidays. My aunt always made the classic Lipton Onion Soup potatoes with this dish. It has forever remained the side dish that I use as well. It could not be easier and the recipe is on every box of the Lipton Onion mix. This is a brisket. A HUGE one. I have 16 people coming over. Lots hungry Russians to feed 🙂 I like to use foil pans for this because I hate cleaning roasting pans…as do you I am sure. Plus since I end up freezing it anyhow, it makes more sense to just do it in ONE PAN. When you purchase your brisket. Do not purchase it cleaned. Purchase it whole with the fat still on it. And place the fat side UP when roasting. NOT DOWN. Now combine your ketchup, dehydrated onion, garlic, chicken base and water in a bowl. Mix it all up to combine. Now slather it onto EVERY nook and cranny. Massage your brisket. Making sure to cover it all over. Then cover it and place in the fridge for 24 hours or at the very least overnight. The next day, roughly chop your carrots and onions. You want nice, large chunks. I had some gorgeous multicolored carrots leftover so I used that. Pour in the wine, throw the veggies on top and also nestle them in between for good measure. You want the liquid to cover almost all the way to the top. I always make mine weeks ahead of time. So these next few steps are crucial. Take the whole pan and place it into the fridge over night or for a few hours until it cools completely and fat solidifies. See all that orangy looking goup around the meat? That’s fat. And you do not need it. It will make your sauce greasy. Just take a spoon and lift up the fat. It will come off easily. And it’s kind of fun. Now we slice. This is a VERY important step. If you slice the brisket with the grain, you can forget about that gorgeous melt in your mouth brisket. You need to cut AGAINST the grain, just like with my flank steak. That way you will get perfectly beautiful slices. This is also why we chilled it first. Not only is it easier to remove the fat, but it is much easier to cut the meat when it is cold. Using a sharp knife we are going to be cutting AGAINST the grain. 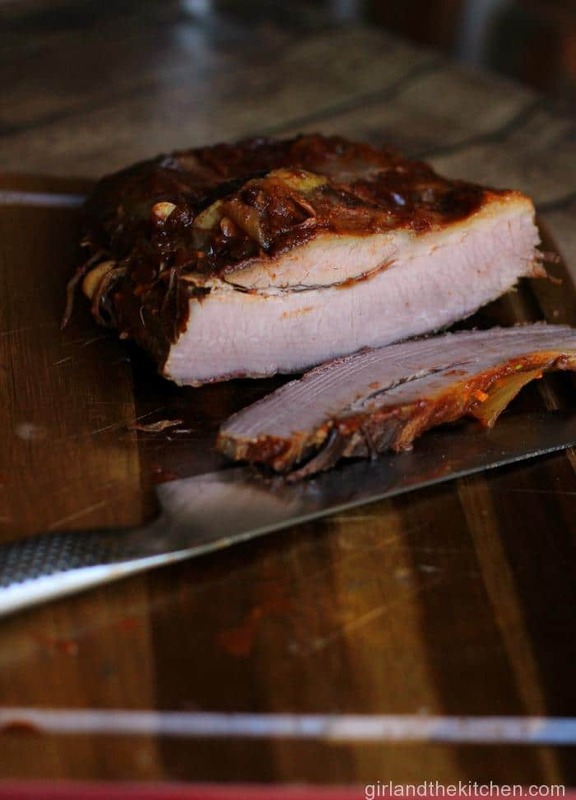 Make you use the length of the knife instead of sawing through the meat with short motions. And now we place it into the pan…FAT SIDE DOWN. Because when you reheat your brisket…it is better fat side down. At this point, I cover my brisket back up…and stick it in the freezer until it’s time to cook it! Reheat it in a 350-degree oven, covered for about 40-45 minutes. And serve. And you will be the ultimate host 🙂 With a few less dishes to clean. 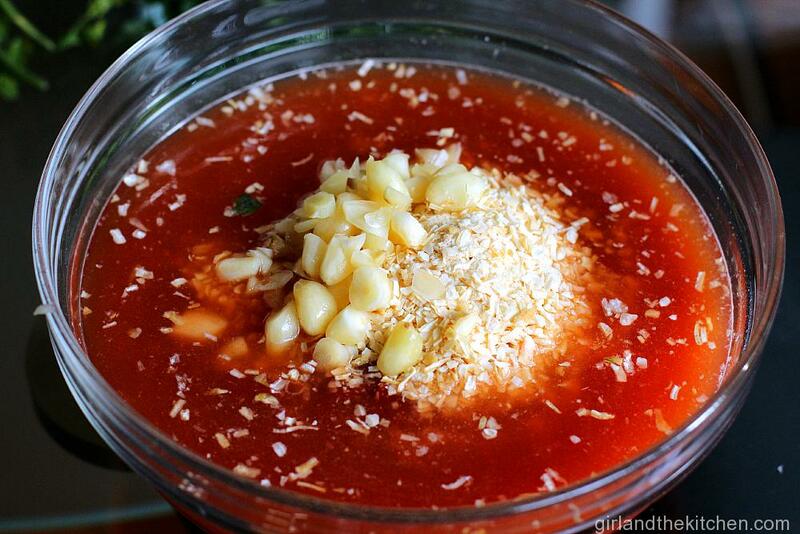 Combine ketchup, water, dehydrated onion, garlic and chicken base and mix to combine. Slather this beautiful mixture onto the brisket sneaking it into each nook and cranny. Let stand in refrigerator for 24 hours. Preheat oven to 275-degrees and place remaining ingredients over brisket in a tightly sealed roasting pan into the oven. Cook for 6-8 hours. Typically the rule of thumb is an hour a pound. But the true test is when it pulls apart with two forks..
Place in refrigerator over night to cool. Remove fat and cut against the grain NOT with the grain. 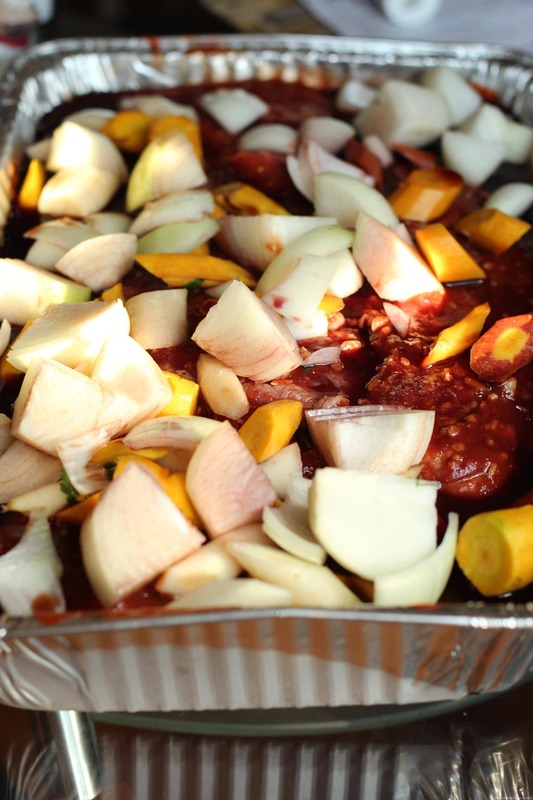 Place sauce over sliced meat and put into 350- degree oven to warm the meat and sauce. You really make it appear so easy together with your presentation but I find this matter to be really one thing which I think I’d never understand. It kind of feels too complicated and extremely wide for me. I’m having a look forward in your subsequent submit, I will attempt to get the cling of it! Can you tell me how many ounces a bottle of ketchup is? Hi Brenda, it is about 14 oz. I made this for Rosh Hashanah. This is the first brisket I made early and froze. It turned out great! Everyone loved it! This looks AMAZING! I’m pinning this to try it myself. 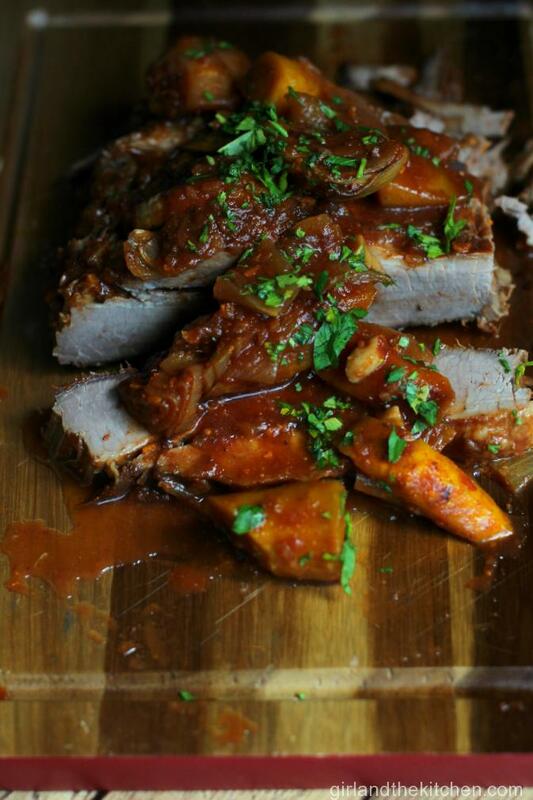 My husband’s family is Jewish, so it’ll be nice to know a recipe to make for Rosh Hashanah! Thanks Tricia!!! Please let me know how it goes!!! This looks really delicious. My sister is the brisket-cooker in our family, but I’m pinning this – maybe I’ll get to make it some time. Thank you so much for this wonderful recipe. I made your brisket for the fist time and it was a huge success at my Rosh Hashanah table tonight. It really does melt in your mouth. I love how you post step by step instruction, it is makes the whole process much easier. Looking forward to more recipes on your blog. Tanusha…thank you so much for the wonderful comments 🙂 I am so glad it worked out! Can I substitute chicken base with home made chicken stock. I think chicken base has MSG. Thank you. You sure can…but remember a lot of what we read about MSG is speculation. MSG in tiny quantities is not bad. But you can absolutely use homemade stock! OMG what beautiful beautiful comments! Thank you so much!!! This comment made my Sunday! I am so glad you enjoyed it! Thanks Kimmie!!! I have participated 🙂 And will keep it up! Thanks so much for sharing this at Savoring Saturdays! I can’t wait to see what you share this weekend! I had it this weekend for Yom Kippur and it was absolutely amazing. Truly better after it’s been frozen and defrosted in the oven. Made this for Christmas. I cooked mine for a bit over 7 hours. I think it was too long because it was kind of falling apart as I sliced it. Very delicious and tender, but I will check it a bit earlier next time. Thank you for the delicious recipe! Sometimes I find it depends on the quality of the meat. When it’s super fresh it tends to cook a bit faster…plus oven often vary 🙂 Perfect for BBQ brisket sammies the next day though 🙂 Have a very happy new year! Yes, the sandwiches were amazing, and I have a couple of pounds leftover with extra sauce in the freezer! How many ounces of ketchup does this recipe require? This recipe sounds delicious! I’m glad you like it!!! It’s 14 oz of ketchup! Let me know how it turns out! I would stick with the 7-8 pounds maybe up it to 10…it all depends if you are also serving any other proteins. I serve quite a bit of food as well as my brisket. HOWEVER, that being said, this freezes so easily, go ahead and have leftovers! It is still perfect in months! Trust me! I just defrosted some that I had from Yom Kippur! And it was awesome 🙂 Please do come back and let me know how it goes! 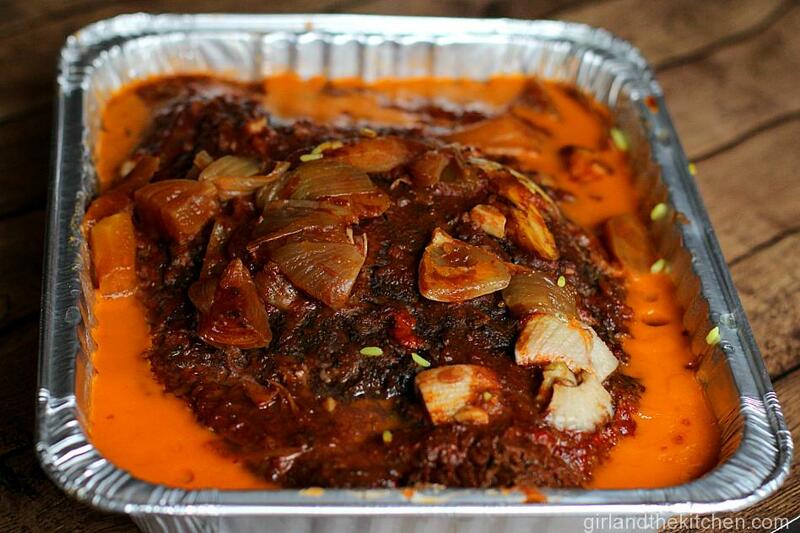 Do you need to defrost the brisket before you cook it or can it go straight from the freezer to the oven? The briskit turned out great and was a huge hit! Forty five minutes was not long enough to reheat it. It cooked for over two hours and then I had to microwave it. It was still the best I have ever had! Debbie!!! So glad it turned out so great for you! I may have a super powerful oven 🙂 but really glad it was a hit! And thank you for coming back and giving me feedback! I just found this recipe and it looks AMAZING, so I’m going to give it a try! I’m making this dish for a much smaller group (4 people), so how do I cut down the ingredients? Also- my fam doesn’t like carrots nor onions (unfortunate right?!) so is there any other veggies you recommend I substitute with? Thank you so much, your page is lovely! Chag Sameach! Chag Sameach to you and your family and please do come back and let me know how it turned out! This time though Im keeping a little more for myself! Susan thank you so much for your warm words and compliments! This made my night! I’m so glad it worked out for you and the family! Thank you for sharing my recipe with your family!!! Much love to you!!! Brisket always seemed too difficult to make (for me)! Love the recipe! Great pictures! Talk about some serious flavors going on here! 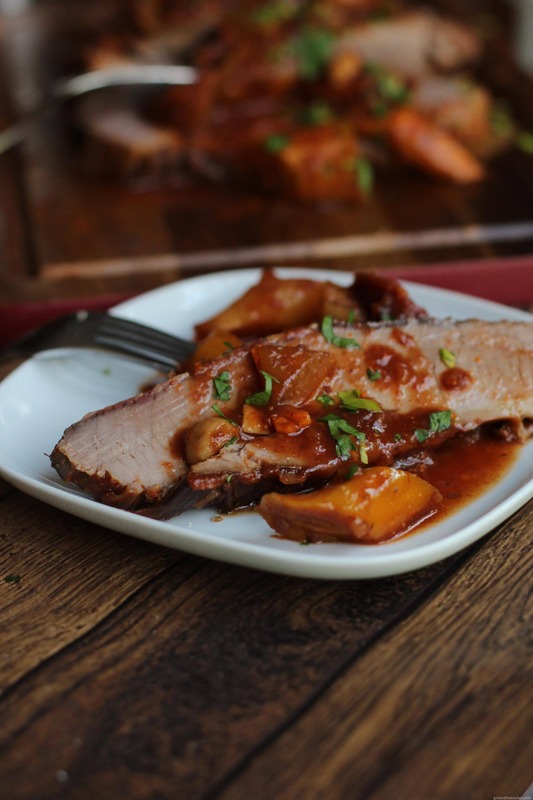 I just love a melt-in-your-mouth brisket and so does the rest of my family! This will be perfect for the upcoming holidays! Got a quick question for you. When I buy a brisket, it generally has a really thick layer of fat across one entire side. Should I leave it alone? Or trim some of it away? Def trim some away… Not all though… You need that fat! And sometimes you can buy it already trimmed… DONT! It’s so much better to do it yourself! I absolutely love anything like this. I’m making this asap. And I love the freezing tips. Thanks. This looks delicious. It may shock you but I’ve never really tried brisket before. Yup. I’m inspired. Ai it’s so ridiculously simple you will be shocked! Yes! Cute boots are a must! Mila, this is just beyond AMAZING! I can feel it melt in my mouth. Great recipe! Hi Lui! Its in Fahrenheit. Thanks! I love the sounds of this….I actually have a brisket in the slow cooker right now. Such a great tender meat when cooked correctly. Love IT!! Thank you Gloria!!! It really is isn’t it!!! What a great recipe! That brisket looks yummy and I love that you took the time to tell people how to PROPERLY cut it! It makes such a difference in the meat! Totally! It makes all the difference with cuts like this and skirt steak! Thanks for stopping by! Brisket and I have a love/hate relationship .. I love IT and IT hates me. I have destroyed my pounds of brisket than I care to admit. Your recipe is awesome! The meat looks juicy and the pics are fabulous! I can’t wait to try this!! Mila that looks divine! And brisket is one of my favourite cuts. I grew up eating Jewish food because two good friends were Jewish and we’d swap my Chinese after school snack for theirs! Hi Mila. I am getting ready to make this for Hanukkah. We are having 20 people for dinner and Brisket is the only protein… should I double the recipe? Yes I would definitely double this because then you can just freeze if you have any leftovers! I made this for Christmas Eve dinner last night for 40 people. 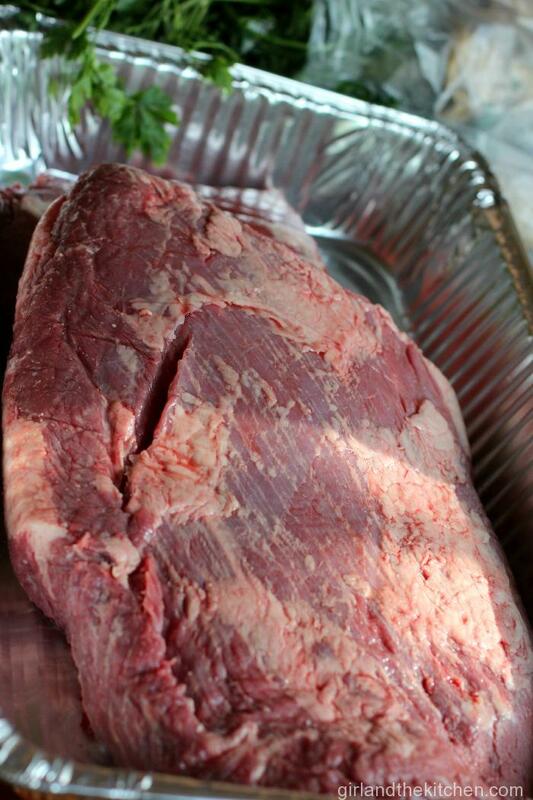 I purchased a 15 pound vacuum sealed brisket from Smart & Final on Sunday and slathered it with marinade, untrimmed. On tuesday I put it in the oven. At 6 hours it failed the fork test. At 8 hours it was fork tender. After cooling for 2 hours I poured off the juice into 2 large containers, set aside the veg, and refrigerated the meat , veg, and juice separately. On Wednesday I removed the hardened fat from the juice and boiled it down from 2 quarts to about 4 cups. I pureed the veg with some of the juice and stirred it back into the remaining juice, making a lovely slightly thickened gravy. I removed all the fat from the cold brisket and since mine was 2 muscles, separated the two, sliced, and artfully placed into 2 oven safe baking dishes. 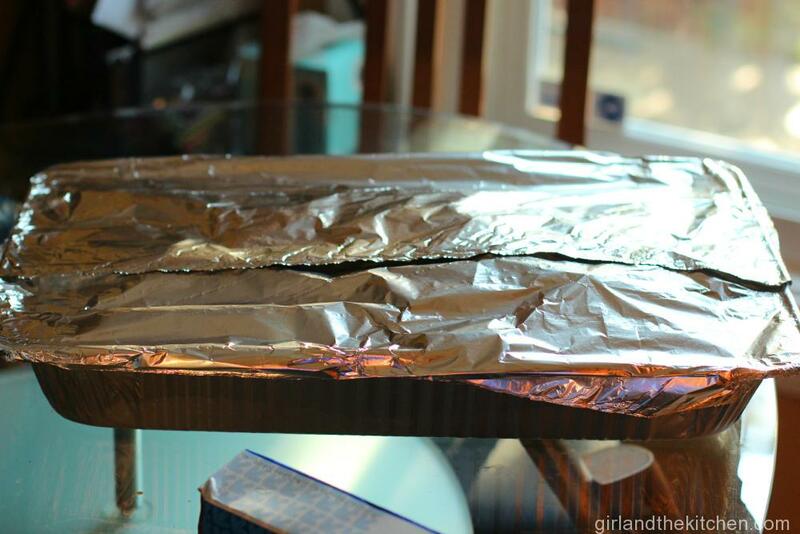 On thursday, an hour before dinner, I poured the gravy over the two dishes of meat, covered with foil, and placed in the 350 oven for 45 minutes till hot (not quite ready at 30 minutes). It was a HUGE hit–melt in your mouth tender and delicious! I’d been looking for something festive and low fuss to feed a crowd and had already made my usual feed-a-crowd dishes for Thanksgiving. This was perfect! Thanks for doing all the hard work and perfecting the recipe! My not-Jewish, Chinese American family loved it! OMG what an amazing comment to read!!! Thank you so much for the warm words and the detailed review!!! I am so glad it worked for your family!!! Happy New Year to you! I just now pulled a 15 pound brisket out of my oven. This is my third time making your recipe–I’m freezing for Christmas dinner next week! I made it over the summer when I hosted a retirement party for 80 people–the ability to make this ahead of time and freeze was essential! Thanks for a great recipe. Emily…awww you just totally warmed my heart!!! I am so glad that it worked out for you over and over again!!! I am beyond thrilled! Thank you for coming back and telling me!! Have a wonderful holiday season! Hi, Mila, this brisket sounds delicious and not that hard to pull it off. I’d like to try it for Passover’s first seder this year, but, how can I replace the wine in the recipe? Maybe with more chicken stock? Thanks! You can replace it with beef stop but the wine really adds an incredible flavor! I would also add in more veggies so that it balances out some of the flavor that you would be missing from the wine. If you are concerned about the alcohol content, the alcohol will burn off and you will just be left with a deep flavor from the wine 🙂 Please let me know how it turns out or if you have any other questions!!! Thanks for reposting this on FB, Mila. I’ll make this for Passover next week, subbing plain tomato sauce and Manischewitz wine. I’ve don a similar one with onion soup mix. The difference in yours is marinating first. I’ll report back after my Seder! Be careful that the Manischwitz does not make it too sweet! I will, Mila–the ketchup has sugar, plain tomato sauce doesn’t. I may use half regular red wine. My Mila Furman Seder, with your chicken soup and this brisket, was crowned my best ever, dear Mila! I have had poor results from brisket in the past, because I cut off too much fat. 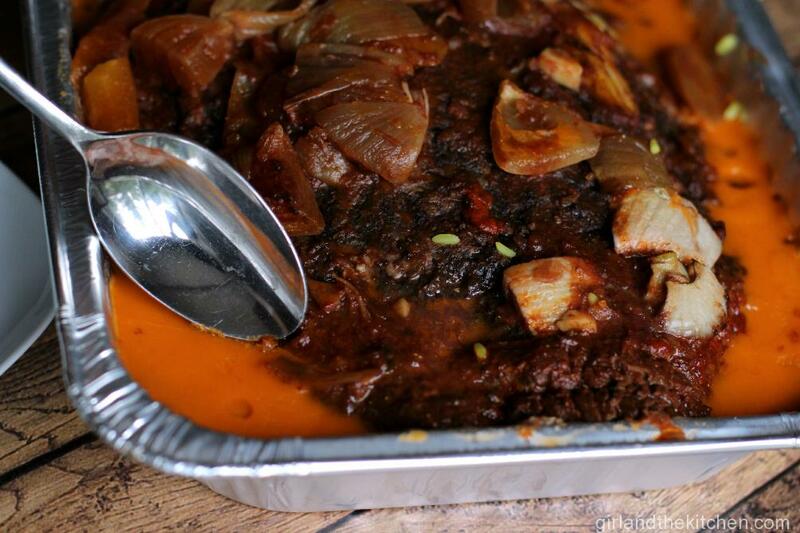 (My dad hated “ungekocht”–overcooked–meat so we never had brisket or pot roast in our house, only rare roast beef. So Mom never made anything of the sort.) Your long and slow technique was fabulous. And my substitutions worked out perfectly–just a hint of sweetness. I always puree my veggies in the sauce (except for some of the lions, which I sliced instead of chunking), which makes a wonderful gravy. Everyone wanted the recipe, so I send them the link. I also used your garlic pan roasted chicken as inspiration for an oven-roasted dish. The only bad news: After sending everyone home with leftovers, I barely had enough left for a meal for two! I couldn’t get that much brisket in one piece. If I have 2 smaller ones equalling 7 lbs does it change any of the cooking times? Came out delicious! Thanks very much! So glad Debbie! Happy Passover to you! I totally choked and cooked the brisket with the fatty side down. I have since sliced and frozen it. Can I reheat it with the fatty side up? And will 45 min at 350 be sufficient? Help! Hi, how much brisket do you think I would need to make for 75 people? I am using the brisket for small sandwiches. It is for my son’s Bar Mitzvah and I plan to have a nacho cheese bar with all types of peppers, salad and watermelon. I really like the idea of making this in advance so I can reheat on the day of and its done. I also like that you made it in the aluminum roasters because I was wondering about that. Any help would be appreciated. Hi! I have two 4-5lb meat, currently in the oven at 275, do I still cook for 6-7 hours? This brisket looks DIVINE, Mila. I can’t wait to try it – perfect fall comfort food. And thank you for all of your work with the step by step process too! 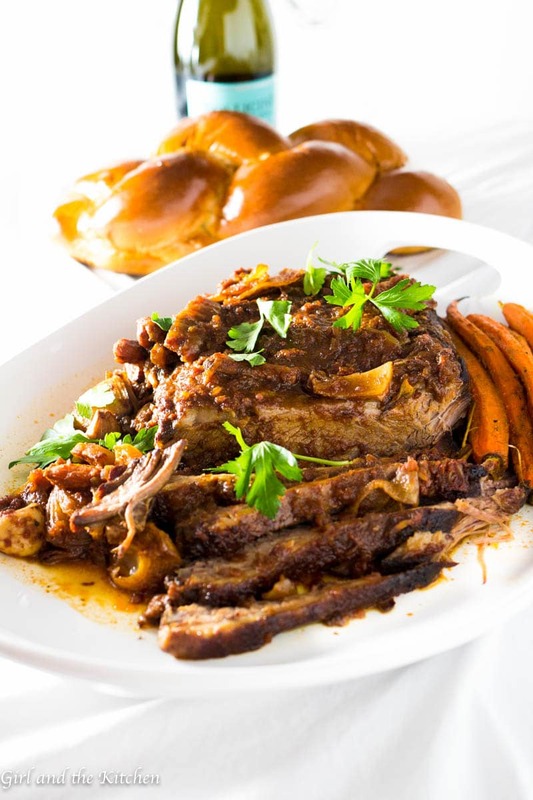 Mila – I just made brisket using your recipe for Rosh Hashanah. It melted in my mouth. I am originally from Ukraine and my mom said she hasn’t had brisket that good since her mom made it. THANK YOU!!! Omg! Thank you for writing this!!! Literally crying! What a sweet comment !!!! Making moms and babushkas happy is my favorite comment!!!! Happy new year darling! Thanks again for this comment! Made my day! Have a question about the cut of brisket? I’ve read about 1st and 2nd cuts – with 2nd cut being better because of the fat. You mention to get a whole brisket – is that the first and second cut? is that called a whole “packer” brisket? HI David!!! Thank you so much for the warm words! 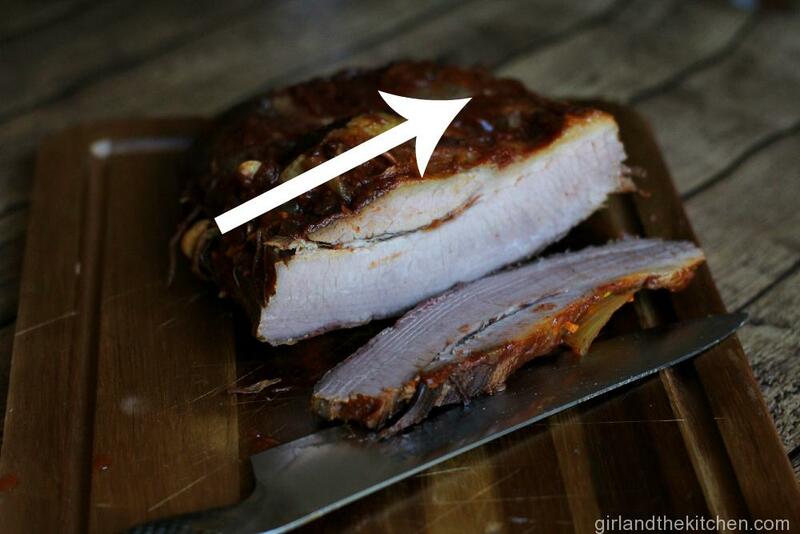 There is a large, fatty, delicious cross-section of brisket called the “point” or “deckle” that runs across the bottom of the fat cap of the brisket flat. The point is elemental in cooking the most amazing brisket you’ve ever had. A brisket with both the point and the flat is referred to as a full packer brisket in the BBQ world and typically weighs between 12-16 lbs. I always buy the point cut if I could. Because then I can remove all the fat that I want. Have a wonderful holiday and let me know how else I can help! I liked that you explained technique. I find this is where most recipes are lacking- even from professional chefs, and this is where you go -huh? why didn’t that come out as good as I was expecting? Thanks! It will be fabulous!!!! Let me know how it turns out please!!! We are making the brisket one day before the Seder. What’s the best way to reheat it if it’ll be refrigerated overnight? Slowly in the oven while it’s covered at 350 degrees until it comes up to temperature. Happy Passover! Hi, I’ve just put together the marinade and wondering if the wine goes in now, or tomorrow when it’s going into the oven? Thanks! Hi Gloria!!!! The wine goes in tomorrow after it has marinaded over night! Just made this for Rosh hashanah. O M G soooo good! Multiple guests raved it was the best brisket they ever had! It was sooooo soft and flavorful. Two comments: 1. We are not the bests cooks so if turned out that great for us then anyone can do it! 2. We did need to double the time to heat it up when serving. It was still very cold after the suggested time. Thank you again!!!! Hi there!!! OMG thank you so much for those warm words 🙂 I am so very glad it all worked out for you! Is it ok to put it into the fridge to cool down right after being in the oven? I always thought you had to let food cool down first. 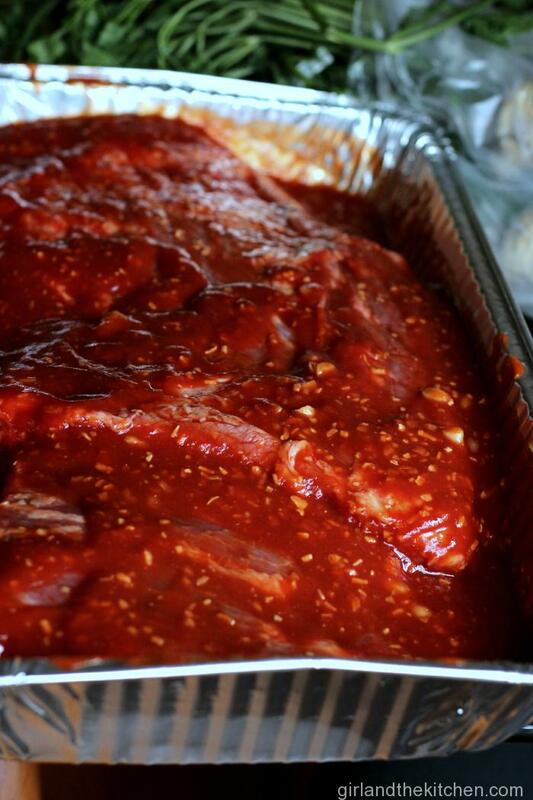 Also, when you go to reheat the brisket the day of… what sauce are you adding on top? The sauce is the braising liquid 🙂 happy holidays!!! I was wondering if you slice the meat before freezing and how many pounds do I need for 50 people? Hi Lee! I usually leave it Whole when freezing. But as long as it’s covered in the sauce when frozen you can slice it… if it’s reheated covered in sauce it won’t dry out. As for how much brisket you need, it depends on if it’s the only main course or how big of meat eaters your diners are. Typically it’s 1.5 pounds of meat per person on the higher end . Sorry for the dumb question but I am not sure what you mean by chicken base. Do you mean something like Better than Bouillion? So it would be 1.5 Tbsp of the powdered cube? Or are you referring to actual liquid chicken stock? I just found your site and am looking forward to trying some recipes. Hi Elisa yes that’s exactly what I use!!! Better than Bouillion 🙂 thanks for commenting! Please let me know how it turns out! At what point do you cut off the fat? I didn’t cut it off. Now it’s sliced and in the freezer so I guess I have to serve it with the fat on. I probably should have trimmed the fat before flipping it to fat side down. Barbara, my apologies this went to trash! You could trim the fat right before serving. Im sure it still tasted delicious!!! Thank you! So that means you just skim fat off right when you take it out of the oven, then cut and serve? Last thing- can i add potatoes?? Hi!!!! Sorry! You can but add like the last few hours! Hi Mila, what a great website! I have a small question- is the freezing step required? 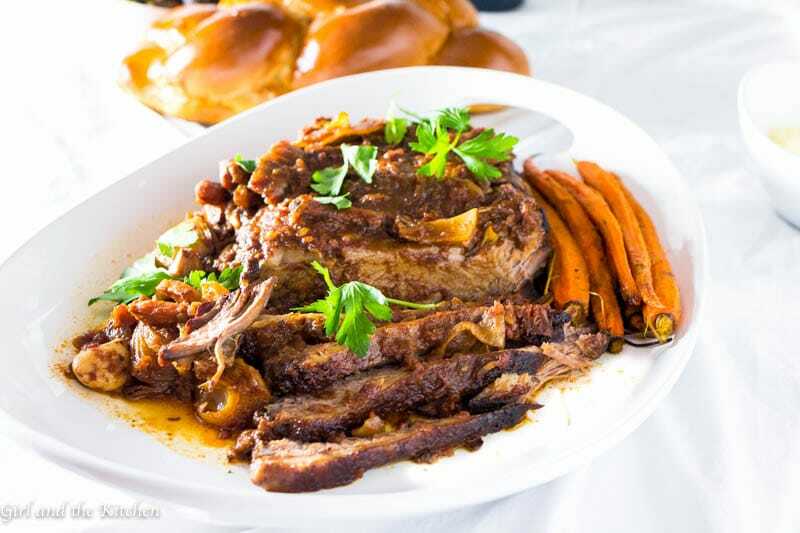 The Seder is tomorrow night (I’m from Israel) and found your recipe only now… so i won’t have time to freeze and re-heat the meat. . Thank you! Hi Mila, found your recipe today, already marinating meat overnight to cook tomorrow. No time to freeze 🙁 I will need oven for about 1.5 hours to make other dishes. If I cook meat first since it takes such a long time, what is the best way to keep it warm? Or should I let it cool, cut of fat, slice and reheat right before serving? Thank you! My family’s new mantra: Magic Happens In The Freezer -which is sooo true! My husband actually put the whole brisket together (“You make me watch so many cooking shows- I want to cook!) under my watchful eye and we froze after slicing, even though it probably could have used an additional hour or so. I took it out the day before Passover, let it mainly thaw in the frig, then into the crock pot on the day of, to slightly cook on low, then stay warm … and WOWZER!!! It melts in your mouth; 20 people at my house were in love. This is my go to recipe forever. Thank you so much! MWAH!!!! See!!!! The freezer is fabulous!!!! Try the same trick with stuffed cabbage, meatballs and any stew! hat size bottle of ketchup are you using in the recipe? Can you cook it and serve it in the same day? Sure!!!! Just marinade it for a bit and then cook away! Hi Mila! Which type of cut do you use for the brisket, 1st or 2nd? Oh no!! I put the wine on the marinade first and now my husband says it tastes a little vinegary. I don’t eat meat so i can’t taste it. Should I throw it out & start again…or is theee a way to salvage? I’m so upset!! Is there a way to balance it better? Reduce the vinegar taste? It won’t taste like vinegar when you cook it! Did you use vinegar or red wine? Red wine. Marinade for 24 hours then cooked for 7…husband said he tastes vinegar. Because I don’t eat it I’m going to need help!!MOM!!! Did you use a super sour wine? Mine has never tasted like vinegar . Used actually a good Cabernet!! Just had a dinner party where I served my first brisket ever, and I followed this recipe exactly…couldn’t have enjoyed it more and that nearly 10 pound brisket was inhaled by our crowd of 16 (5 of whom were teenage boys who had just got home from swim practice). I’m oh so glad I found this delicious recipe and the suggested side of Lipton onion soup potatoes. Super easy way to serve a crowd with little prep on the day of the dinner. Love, Love, Love this recipe! Thanks, Mila, for sharing!! Awwwww how awesome! I love this comment so much!!! Thank you for sharing! Hi, if I plan on freezing the brisket, do I cut it before freezing or before oven-cooking following freezer period? Read all reviews – this sounds so good – one question – when to put on salt and pepper? Going to make this for Thanksgiving. Thanks! Your brisket is cooling in my refrigerator as I type. It looks deliscious but I find the sauce a little too ketchup-y/sweet. Any suggestions on how I might doctor it a bit? Mila, I love your recipe. I did it last year. Fortunaly I found it again for this year. What kind of sauce do you recommend for reheat? Thank you. Oh! Put the brisket back into the pan… and add some more wine or stock to thin out if necessary!!!! Where does the sauce come from? I’m missing that part of the recipe for some reason. I have just completed making your fabulous brisket for a family party tomorrow. All cut and ready to reheat. I removed the vegetables as some in my family might not apppreciate them (as I do). I puréed them and it is quite a lot. I am worried that I might not have enough actual gravy. What if I thinned the puréed veggies with some chicken broth to add to the gravy that the brisket is going to reheat in? Sorry just seeing this now!! I think that is a great idea!!! Let me know how it worked out! It worked out very well. The brisket was truly melt in your mouth as promised. Received request for the recipe too. – You mentioned leaving the fat on and to cook fat side up – I totally get that, but the picture you posted is of a VERY clean tri-tip. When I buy it, one side is covered in a thick fat layer. Should I take some fat off before starting? Also, I’d probably like to trim some of that fat layer off after cooking but before slicing. Would that cause the brisket to fall apart when slicing? – Recipe mentions using 6 large carrots – is that enough for all the people your recipe feeds? It seems like you’d need a lot more carrots. – If the carrots are intended to be used as a side dish to the brisket, regardless of the amount used, can they be cooked for 6-7 hrs – wouldn’t they be cooked to mush? That would be fine if one intended to puree the sauce. But as a side, should they be cooked so long? – You mentioned making the Lipton Onion Soup recipe for potatoes to use as a side. They cook at a different oven temp than is required for reheating the brisket. Do you make the potatoes in advance and reheat at the same time as the roast? Sorry for all the questions, but as I said, this is an important dinner and I’d like to serve a great meal. I appreciate any help you can provide. THANKS so much for sharing a recipe that so many people consider to be a winner!!!! This recipe looks so great I can’t wait to try it. I’d like to serve it for an important dinner I am having in 3 weeks. I have a couple of questions and I hope you’ll have time to answer. 1. Brisket usually comes with a large fat cap. You mentioned leaving the fat on the brisket to cook fat side up, but the picture you posted shows a very lean brisket. I’ll leave it on, but I do want to trim some before I slice. Agree? 2. 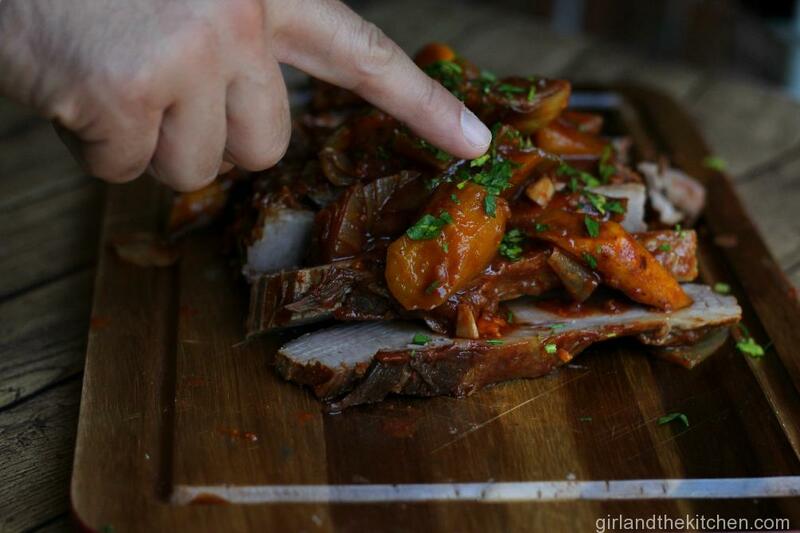 I want to serve the carrots with the brisket. It doesn’t seem that the chunks of carrots will stand up to that long cooking and reheating time. Should the carrots be added later if you don’t intend to puree the veggies? 3. I’d also like to serve potatoes – you mentioned the Lipton onion soup potatoes – I love those too, but they can’t be part of the make-ahead brisket. Have you ever prepared potatoes that can be cooked with the brisket? Hi! Have you tried this recipe with a slow cooker? If you have, do the instructions change at all? Thanks! Hi! No I have not because the flavors seem to mute out in a slow cooker. I would try cooking them for the same amount of them and see how it goes. Good luck! 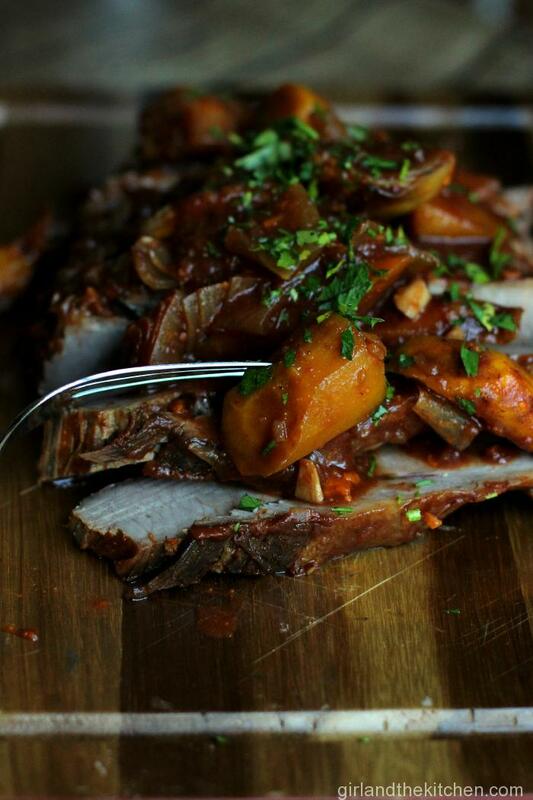 Do you freeze the cooked, sliced brisket in the sauce with the cooked vegetables? And do you reheat with the cooked vegetables as well? Also, do you reheat directly from the freezer? If not, what is the defrosting procedure? Yes I freeze is sliced with the sauce. I place everything into the oven and reheat it slowly at 350 degrees for about 45 minutes until it comes to 160 degrees. Hello…I want to try briscuit for next Saturday’s Passover! Yours looks delish. Question: can you tell me what brand of wine you used? And what kind? I can’t even remember! I always use a pleasant red wine. It really will not matter what kind as long as it is not too sweet. If you want to drink it..then it’s perfect to cook with.